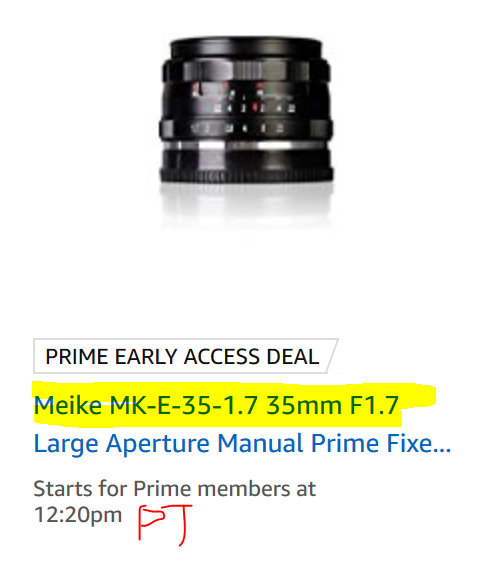 Starting at 3:20pm ET today, in the Gold Box, there is a lightning deal on the new condition Meike 35mm f1.7 manual prime, model MK-E-35-1.7, for the Sony E-system. The price before the sale is $90. The sale price will be revealed at 3:20pm ET (12:20pm pacific). The lens averages 4.5 out of 5 based on 24 customer reviews and has 17 answered questions. It is only available for the Sony E system.